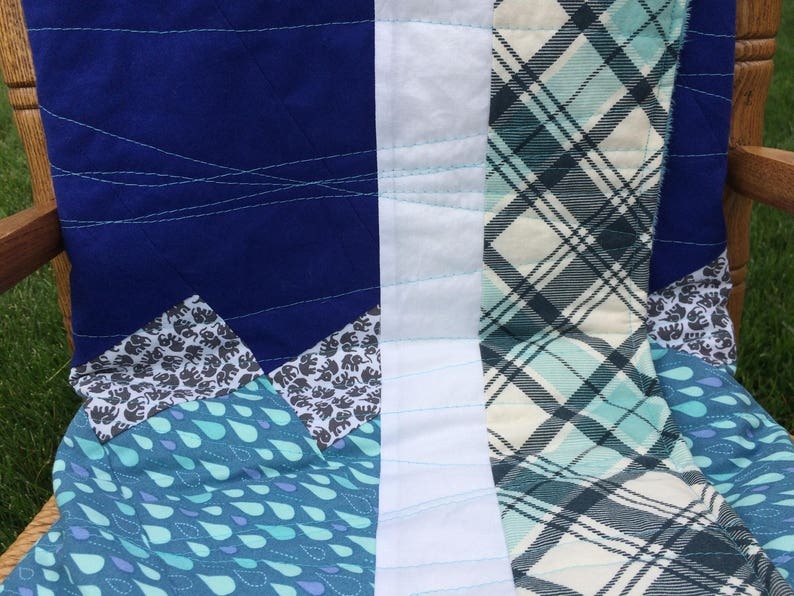 Shades of blue and grey are cool and calming in this patchwork quilt. The picture-frame border is made up of plaid and polka-dots, while the inside fabrics include sweet elephants, chunky raindrops, and a solid royal-blue in the middle to break up the patterns! The entire blanket is top-quilted to a cotton-poly blend batting using a fun set of wavy stitches. The quilt is backed with an aqua-colored faux-chenille which is super soft and cuddly! This quilt measures a generous 39"x 45" and would be perfect for your toddler's bed or for your older child to snuggle up with on the couch or long car rides! If you would like another item made-up using any of these fabrics (e.g. a bib, burp-cloth set, booties), or if you would like a custom quilt made, please contact me so we can create something together! I have hundreds of fabrics to choose from and would love to hear what you have in mind. Machine wash cold - gentle cycle, tumble dry low or air dry. Some puckering along the quilted side after washing is normal and adds to the beauty of a quilt!